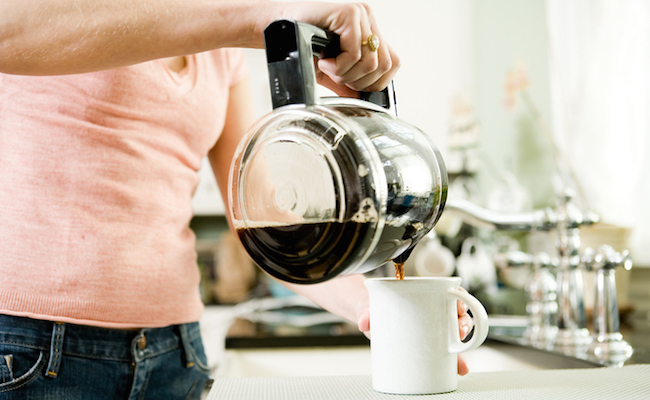 When it comes to the health benefits of coffee, there are a lot of mixed feelings about it. There are several known pros and cons to drinking the popular hot beverage, but overall, it’s generally touted as a relatively healthy thing to drink—especially compared to other caffeinated alternatives like soda or energy drinks. The latest findings on the effects of coffee come from two different studies that suggest it might be tied to longevity. In the first study, which was also the largest coffee study ever conducted, the coffee consumption habits of over 520,000 people from 10 different European countries were tracked for a period of just over 16 years. Researchers found that the higher people’s daily consumption of coffee was, the lower their mortality rate. Those who were drinking three or more cups a day, which was about 25 percent of all participants, experienced a significantly lower risk of mortality at a 12 percent decrease for men and a 7 percent decrease for women. In the second study, coffee consumption as well as other diet and lifestyle habits were tracked among 185,000 Americans over a period of about 16 years. Similar to the first study, the researchers found a link between coffee consumption and a lower mortality rate from health conditions like cancer, heart disease, respiratory disease, diabetes, stroke and kidney disease. Those who drank one cup of coffee a day showed a 12 percent reduced risk of mortality while those who drank 2 to 3 cups daily showed an 18 percent risk reduction. The findings for this particular study are important because unlike the first one that focused on European populations, this one involved a diverse population of Americans, including African-Americans, Native Americans, Japanese-Americans, Hawaiians, Latinos and Caucasians. Despite two big studies showing a clear link between higher coffee consumption and increased lifespans, it would be a big mistake to assume that more coffee leads to longevity. Since these studies were purely observational, there’s no evidence to say that drinking more coffee will cause someone to live longer. It’s possible that those who drink more coffee are simply healthier due to some factor that the researchers didn’t consider and control for. In other words, don’t start increasing your daily coffee intake just yet. If you can’t handle more than a cup a day or hardly any caffeine at all without getting jittery and anxious, then your best bet would be to listen to your body to keep it healthy. If you do, however, want to experiment with increasing your coffee intake and are in good health to do so, make sure to do it safely. While caffeine content varies depending on the type of coffee and size of mug you use, you can estimate that four 8-ounce cups of coffee will put you at the average limit of 400 milligrams of caffeine. According to WebMD, a moderate amount of caffeine, which is about 300 mg, or three cups of coffee, is perfectly safe for most healthy people. If you have high blood pressure, are an older adult, or are sensitive to stimulants like caffeine, make sure you talk to your doctor before increasing your coffee intake. Ha, ha, ha - every couple of years research finds opposite results. We drink 1 cup of coffee a day. Hubby puts cocoa in it with a spoon of Sugar in the Raw...yum! Grazie dell'ottimo articolo. Adoro il caffÃ¨!! I'm not a coffee drinker, but I'm all for advancing our knowledge-base through solid research. Morning coffee for waking up.